Yeditepe University organizes Introduction Days in order to enable candidate students to choose their university professions by recognizing their professional fields in accordance with their interests and abilities. 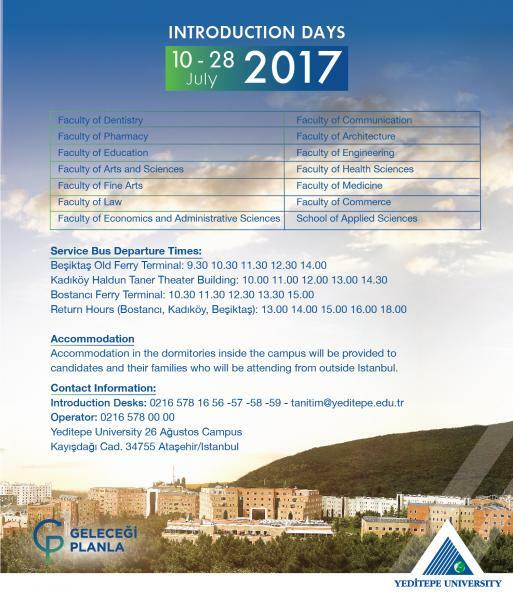 Yeditepe University Introduction Days will be held from July 10th to July 28th 2017 (including the weekend) between 09.00 and 17.30 at the 26 Ağustos Campus Social Facilities Building -1 Floor. Candidates who will visit our campus during the Introductory Days will have the chance to meet with Yeditepe University academicians and students to get information about academic education, scholarships, campus facilities, laboratory infrastructure, Erasmus - Exchange agreements, and student clubs. University Candidates will be able to create their own preference lists by examining the Quota, Success Ranking, Scores, Number of Academicians and Course Programs of Foundation and State Universities covering the last 3 years by using the Plan Your Futurepreference platform developed by Yeditepe University.